This spacious 2700 square foot home located on Taw Caw Creek is a great vacation and getaway for your whole family. This house has two large bedrooms upstairs along with 2 baths, a large great room and kitchen overlooking lake, and a huge air conditioned sun porch for your family to kick back and relax. The lower level has three bedrooms, 1 bath, and a game room that has a pool table. The great part about this house is the sun porch upstairs; it gives you a great view of the lake and the Wildlife Refuge across the lake. You can sit out on the porch and watch the sun rise in the mornings while enjoying your cup of coffee. 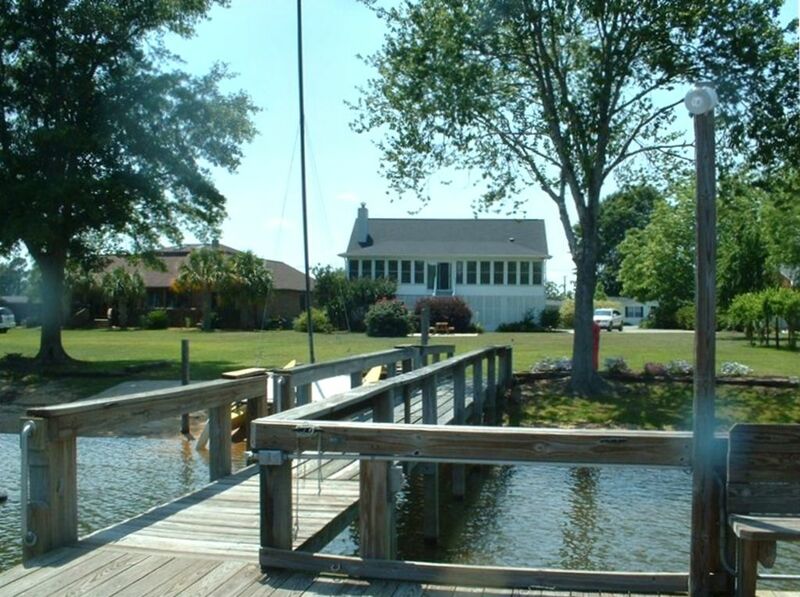 The deep water dock has 8 foot of water at end of dock great for fishing and sun bathing. A sandy water bottom along shore great for swimming. This house is great for multi-family vacations. We are located across from the wildlife refuge. You can wake up to amazing sunrises and see lots of beautiful wildlife. 2 car garage that we use for game room. We have ping pong table, pool table, and foosball table in the garage. Side by side Stainless Steel with ice maker and water in the door We also have a second refrigerator in the garage for extra space for cold items. Glass countertop stove located in front of a picture window overlooking the lake. Beautiful home and a near perfect location near the big water right in the mouth of Taw Caw Creek. A short walk to Goat Island Restaurant Perfect for the entire family. We'll be back. Very clean and spacious house. Very accommodating for 15 golfers. Awesome house. We had 15 guys come down and golf in the area. Very spacious kitchen and living area. Relaxing sun porch that overlooks the lake. Plenty of bedrooms to sleep everyone comfortably. House is updated and clean. We have stayed in Summerton area for 8 years for a long golf weekend. We will definitely rent this house next year. Our family of 12 had plenty of room, the bunk bed room is small and the beds are a little wobbly but OK for kids.The other bedrooms have plenty of room though some of the mattresses could use updating. The game room was an added bonus. The house doors stick (interior and exterior) and are hard to open (especially the door to the game room) and the interior could use some detailed cleaning/repairs. The exterior could use pressure washing and the bushes at the back stairs trimmed (the bushes are overgrown and block the view of the lake).but overall the house is very good. Loved the dock, boat ramp and sandy beach. Was able to launch and tie up our 4 jet skis right next to the dock. The creek is very large and the water a lot smoother than the main lake - we went to the edge of the main lake but stayed in the creek as it had no stumps and was smoother. Creek is big enough to ski and pull tubes. Sunrise from the dock is spectacular and has ducks, geese and rabbits that show up every morning. The whole family swam and participated in lots of water activities (kayaking, canoeing, paddle boarding) right from the dock and sandy beach. The back porch is air conditioned and a great place to eat and hang out w/rocking chairs and large picnic table. Would rent this house again. Thank you for your review and letting us know of some of the issues.We will fix them immediately. I am so glad you had a good time and hope you will remember us the next time you want a vacation at the lake. We have a group if 11-13 people who meet for a golf tournament in the area. We have been coming to the area for over 20 years and have stayed in hotels. We have used this house for the last three trips and will never use a hotel again. This house has it all! We'll be back as lomg as they will have us. Everything was wonderful. The blades on the ceiling fan in downstairs back bedroom were loose. It could use a light in the back yard between the house and the dock. Wonderful Stay in Taw Caw Creek - Highly Recommended!! !